Sixteen hikers surprised the coordinator (moi) by showing up for a fairly moderate hike for Thursday on a day when the weather was nothing if not menacing. 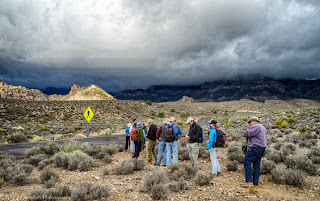 Driving to the meeting place, a bank of clouds over Red Rock and the Spring Mountains appeared to be a wall that covered all the peaks including the escarpment. 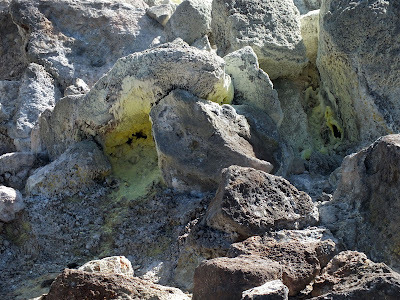 A rainbow even made a performance among the rocks. 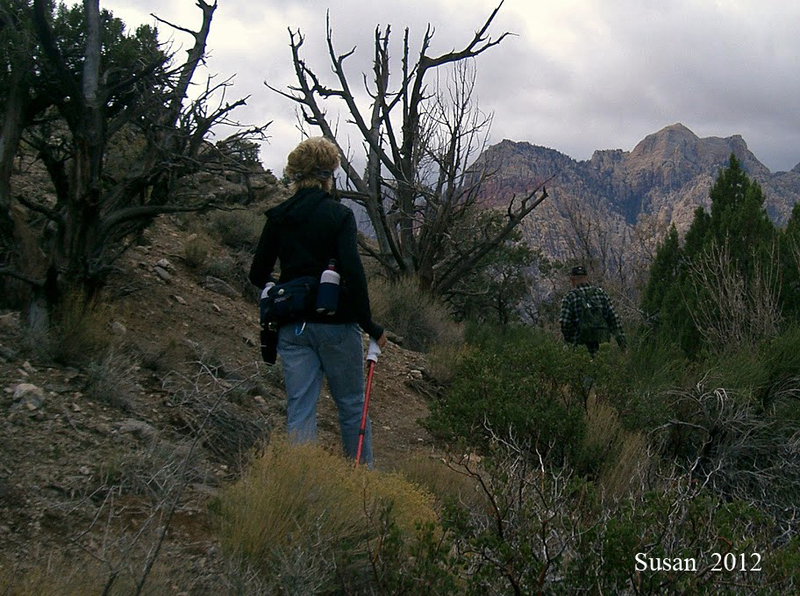 Nevertheless, the show must go on and we drove into the park to start our hike at the Sandstone Quarry turnout. 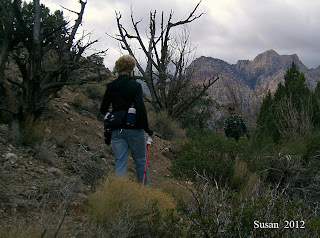 We hiked across the canyon floor at a fast pace on the Grand Circle Trail towards the White Rock Hills. Not knowing what the weather would do, we didn't want to waste time in case it started to rain. We were headed in the direction of the blackest clouds. 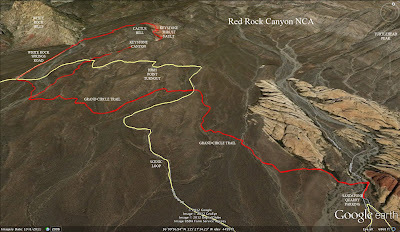 After the second crossing of the Scenic Loop, we hiked up the dirt road and continued up the Keystone Thrust Trail. Mike Says, "Maybe I won't go this way!" Bypassing Cactus Hill on a day when the weather was so unpredictable (not to mention the wind), we continued down to the fault area where we took our break. 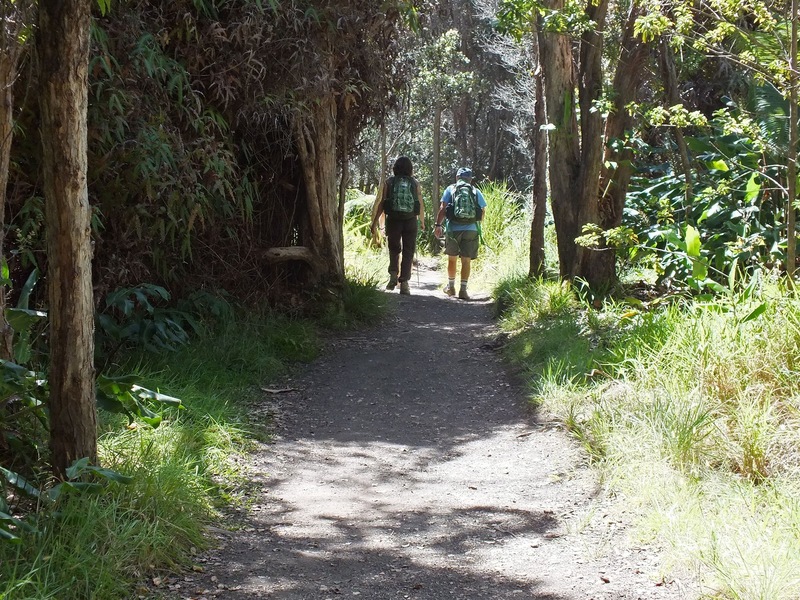 Almost four miles into the hike, we had only been hiking around 1.5 hours. This was another excellent group of hikers who stayed together from beginning to end. 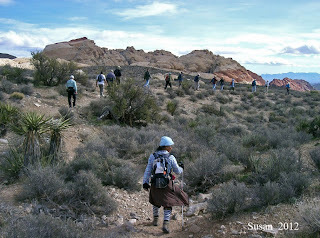 After the quick break, we headed down the wash in front of us called Keystone Canyon. 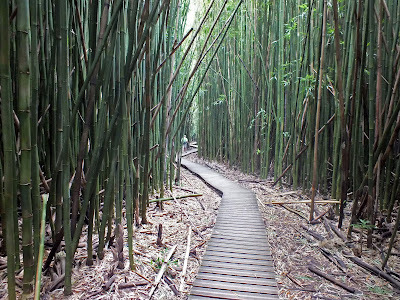 Although there is some brush, there is a trail as well. Staying in the wash, we came to the culvert that crossed under the Scenic Loop Road. 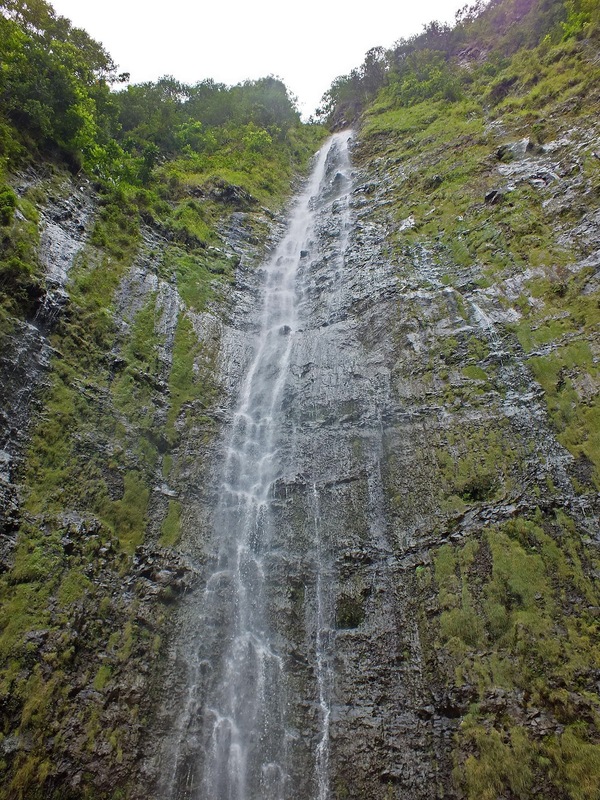 Sixteen hikers ducked into the culvert and came out the other side. We continued down the wash until we spotted the landmark juniper tree where the Grand Circle crossed the wash.
We turned left at the Grand Circle Trail and returned to Sandstone Quarry. 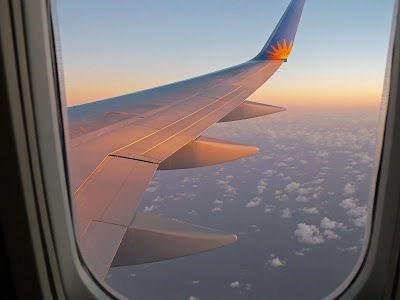 The sky in front of us was much better looking than the sky behind us and we were breathing a sigh of relief that we escaped even a single raindrop. 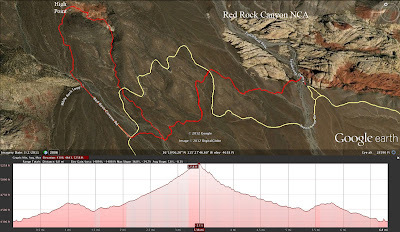 The fast pace was kept as best as the coordinator could and everyone got a good workout on a refreshing new route that included a little of just about everything. Seven miles, 1000 feet elevation gain, and three hours. Recently, Chris and Diane Dempsey went to Hawaii for a much deserved vacation. Guy and Rosie Galante joined them for the first week on the Big Island portion of the trip. 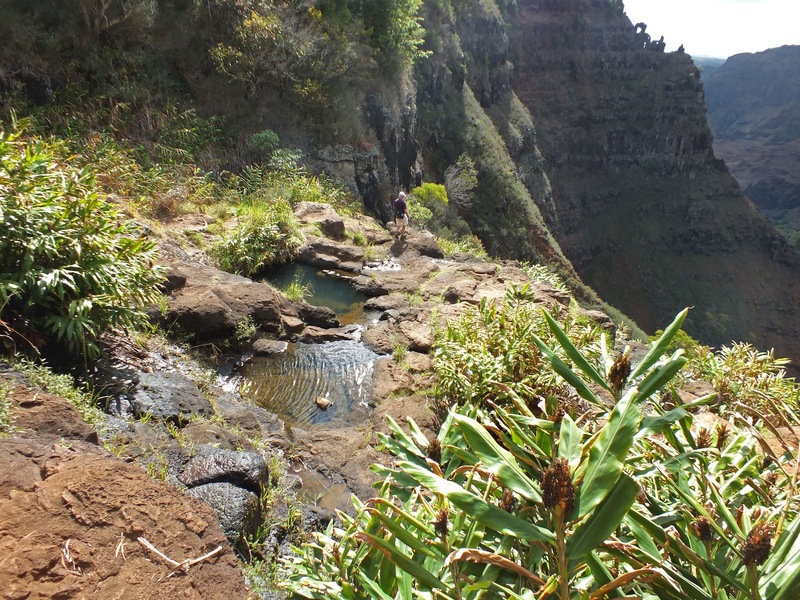 During this wonderful excursion, the four of them visited several sites and went on a few hikes. The photos and blurbs below tell a small part of their wonderful time. Thanks, Chris, for sharing your stories. The photo above was taken right after Chris and Guy were dubbed official Junior Rangers. They both had chosen a junior ranger hat because of their small size heads. The man at the counter made them take the junior ranger oath and off they went with their official junior ranger cards. 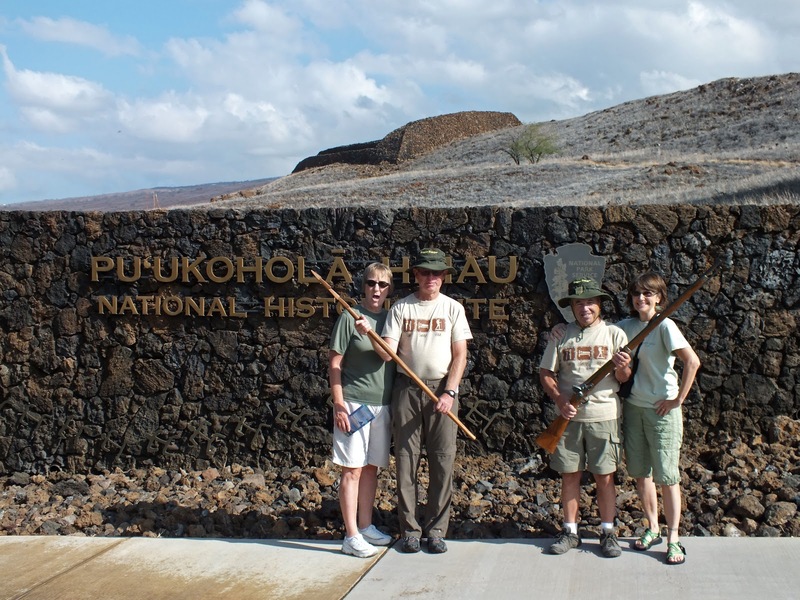 The Pu'ukohola Heiau National Historic Site is where the Temple on the Hill of the Whale is located. It is the stone structure seen in the background and is "one of the last major sacred structures built in Hawaii before outside influences altered traditional life permanently." 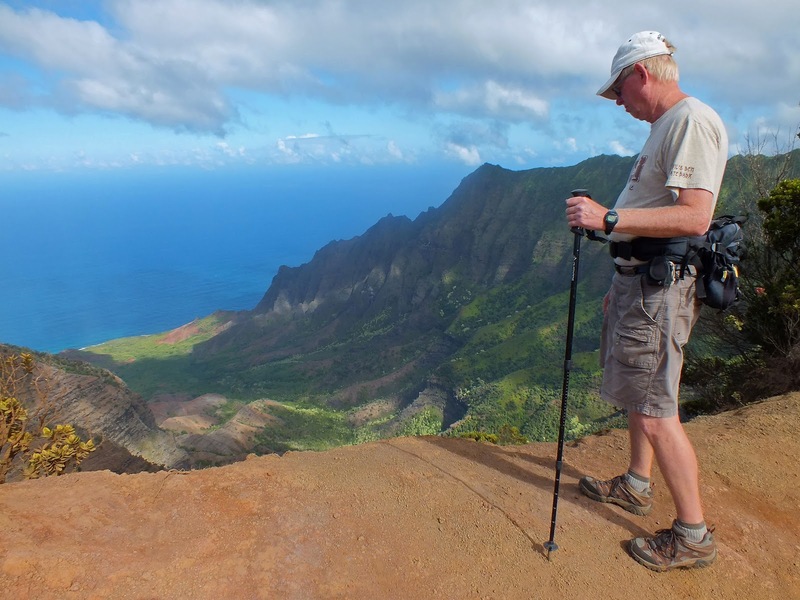 At the Pololu Valley Lookout trail, Chris, Diane, Guy and Rosie hiked above the treacherous cliffs to get the gorgeous view in the photo below. 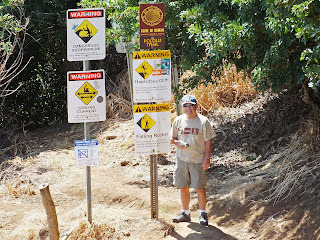 To the left ... well, can you just imagine Guy's reaction to all the warning signs? We miss Guy around here! 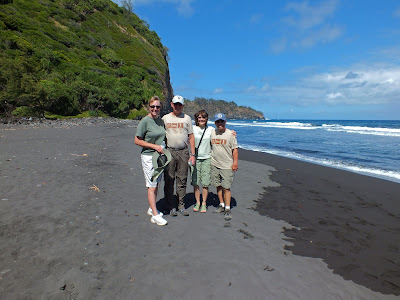 The trail ended down on a black sand beach. Over 100 beaches (with black, white and green sand) line the Big Island's 266 mile long coastline. 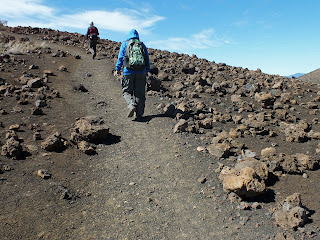 The next day, the chosen hike took the group up to the 13,796 elevation feet range (highest point on the Big Island) where it was quite cold. The Mauna Kea State Recreation Area is filled with old volcanic craters. Lake Wai'au on Mauna Kea is the third highest lake in the United States, at an elevation of 13,020 feet. You can see 90% of the visible stars from Mauna Kea, home to 13 world class telescopes from 9 different countries. 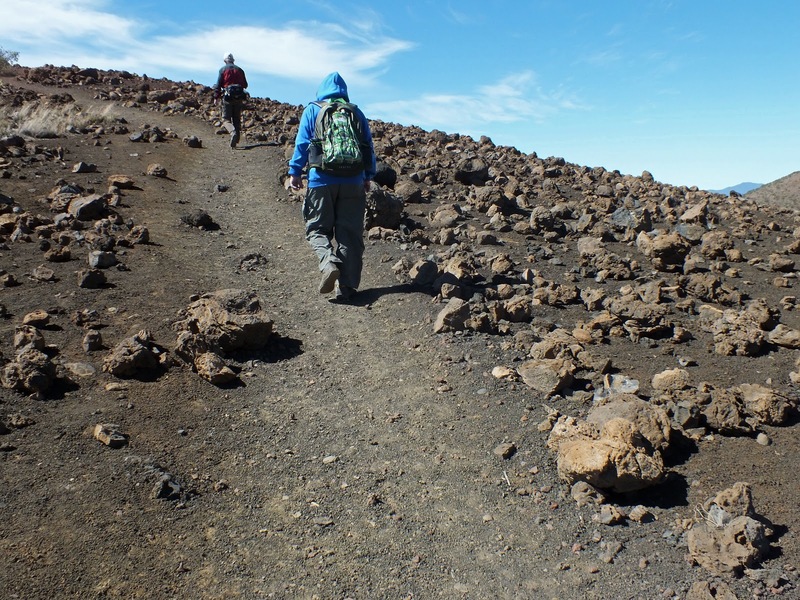 So, the four hikers trekked up Mauna Kea then Chris decided to continue out a trail for a ways while the rest of them waited. 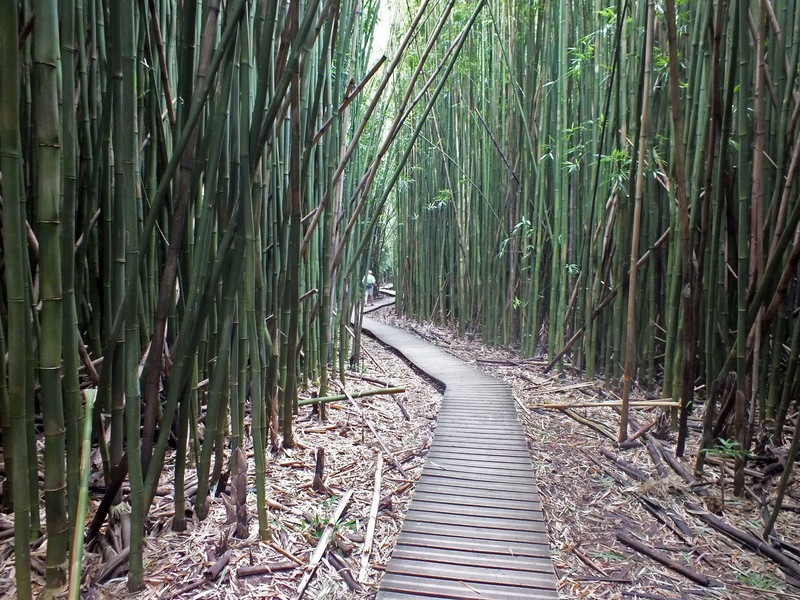 In the photo to the left, you can barely see Chris on the trail. 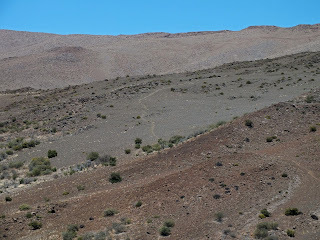 As you can tell, the landscape was pretty barren. 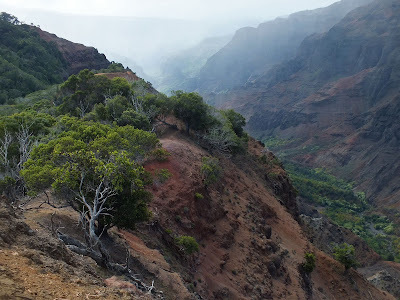 There is actually real desert terrain in Hawaii contrary to what you always see in their vacation advertisements. 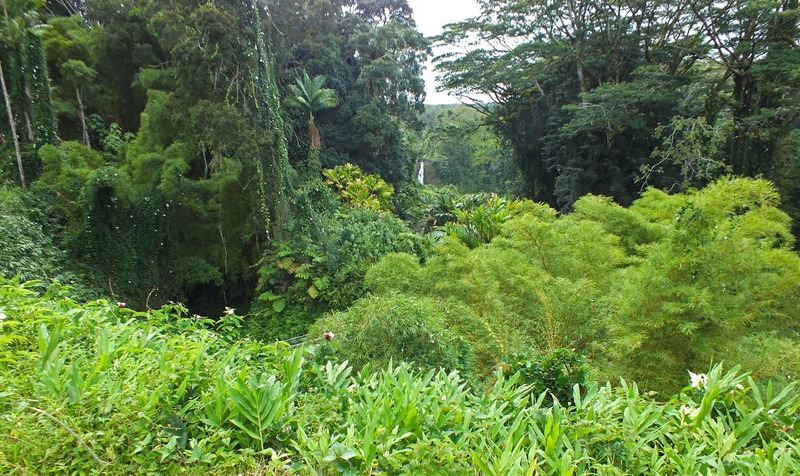 After their trek in volcanic desert, the four tourists travelled next door to Hilo where there is a rainforest due to its location on the eastern coastline. 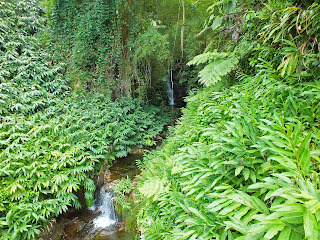 The lushness was quite a stark difference in terrain here. In the nearby Akaka Falls State Park, the photos of interesting foliage below were taken. 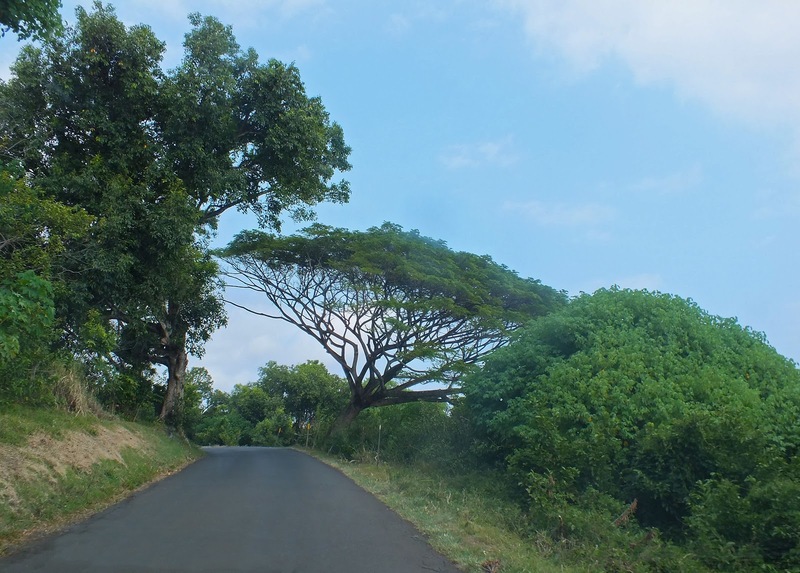 The tree that Diane is standing in front of (top right) is a banyan tree. 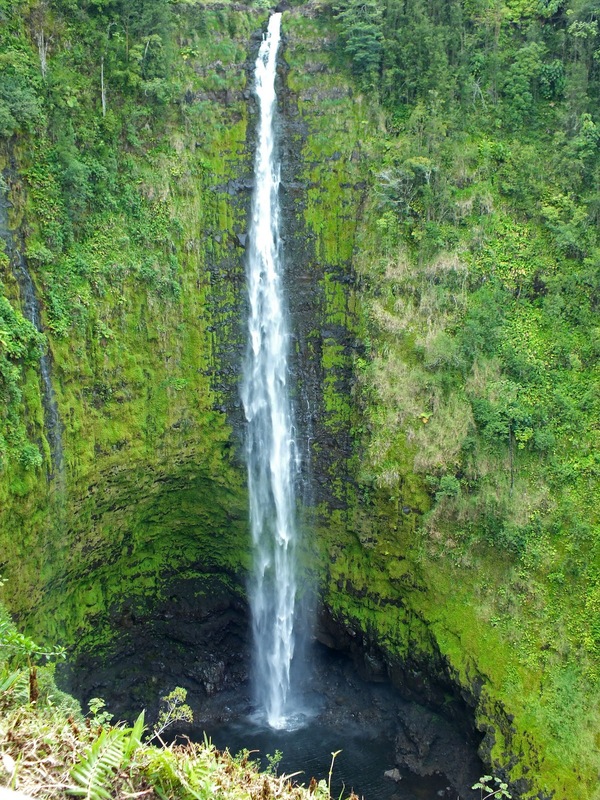 Akaka Falls, seen above, plunges 420 feet in the midst of lush bamboo filled woodlands. 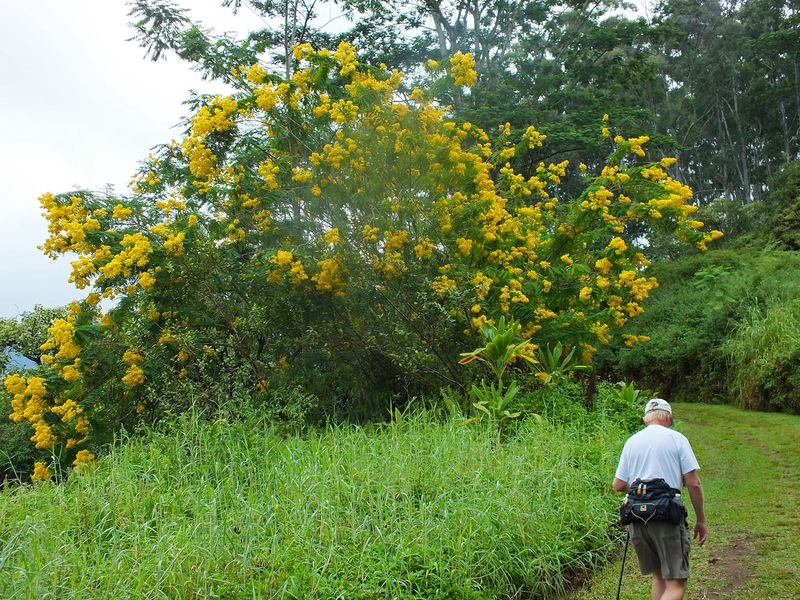 It is found on a paved highway in an area where sugar cane was once grown north of Hilo. This is also an area that was hit by the great tsunami of 1946. 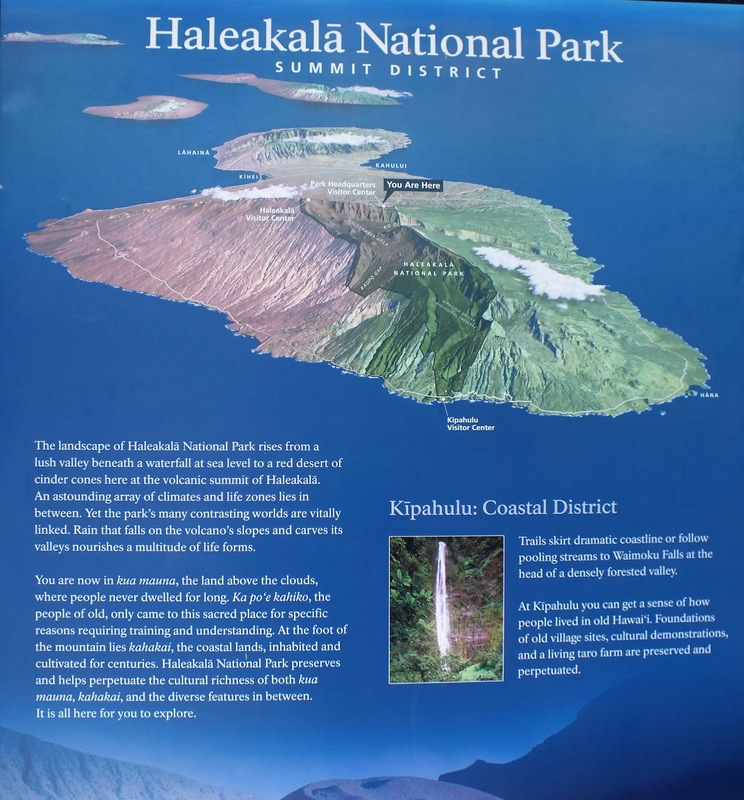 This area receives an average of 240 inches of rainfall per year. Mauna Kea, which is located perhaps thirty miles away receives only 20 inches. 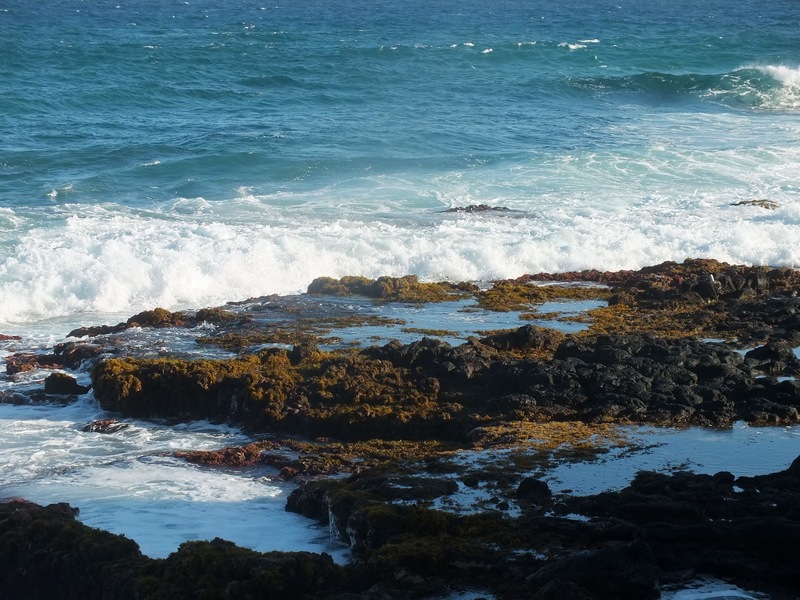 Must be interesting being a weatherman in Hawaii! 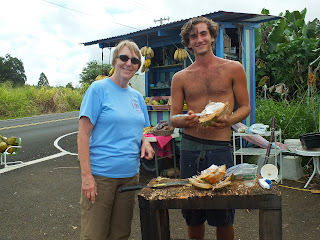 No, Diane didn't stop to flirt with the locals ... probably ... however, this guy and his wife were selling fruit on the roadside where they also lived in a trailer. Hmmm. He looks happy to me. Below, the tourists stopped in for the southernmost American bakery delights. 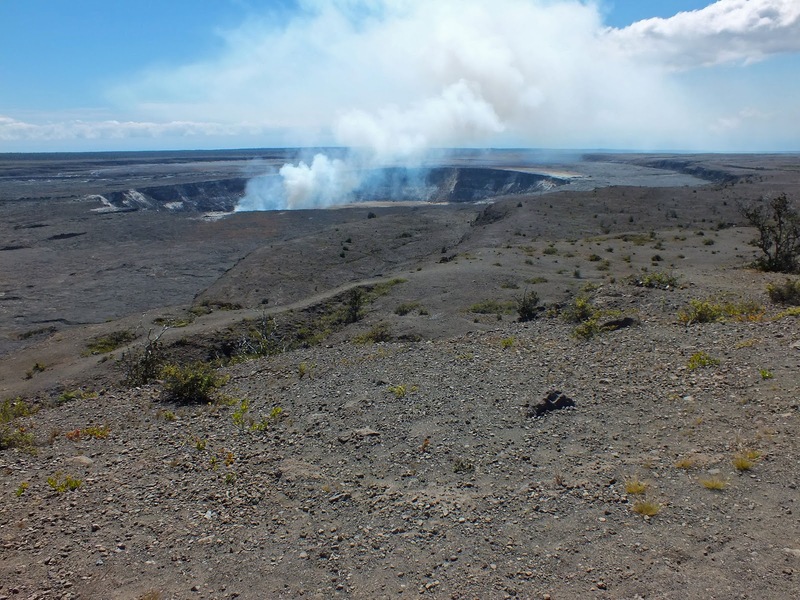 The next day, the four club members explored the Crater Rim Drive at the Kilauea Caldera and found a smoldering Halema'uma'u Crater seen above and to the left. Also off of the Crater Rim Drive is a hiking trail that goes to an old volcanic crater called Kilauea Iki Crater. 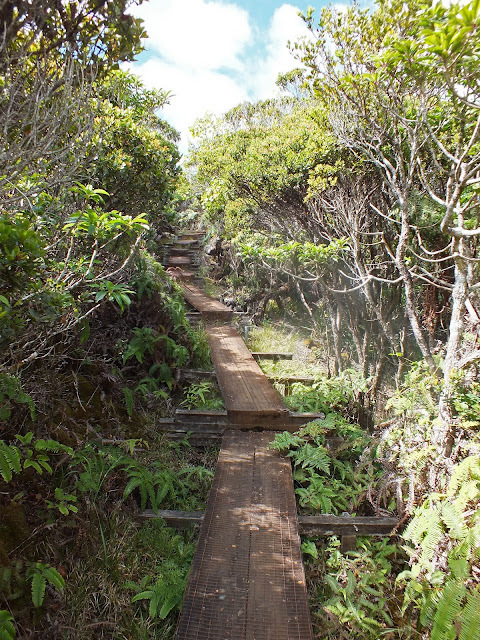 The foursome decided to get some exercise on this trail. 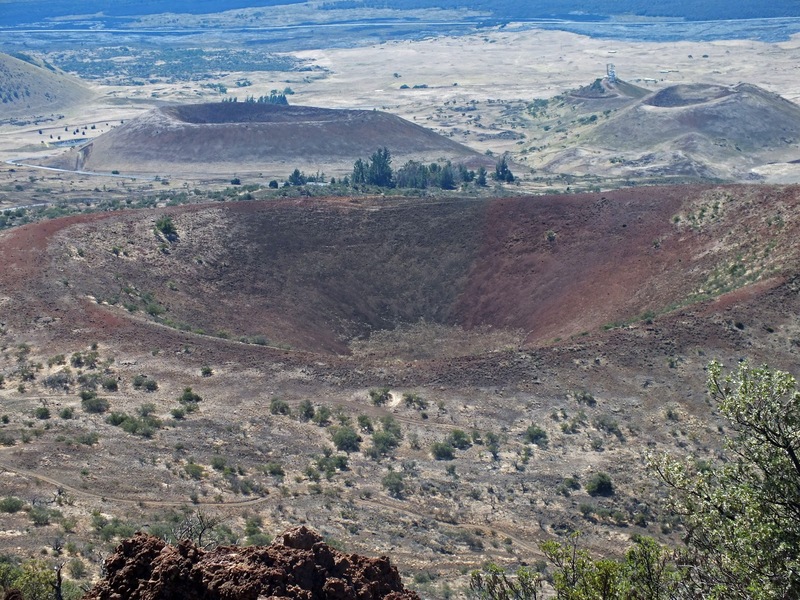 This crater had been "asleep for almost a century when it became active in 1959. Then it erupted into gargantuan fountains of lava, some reaching a staggering 1900 feet. 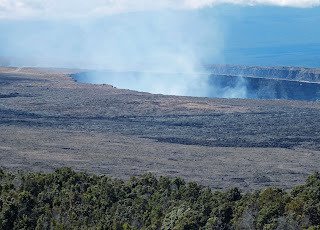 The lava mostly receded back into the vents and after 36 days it stopped. 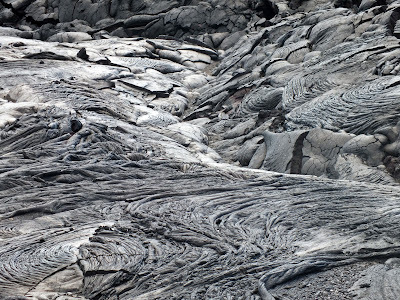 The lava lake cooled and cracked as sheets of lava buckled and warped." Nevertheless, Guy and Rosie walked around in the crater taking photos of the carnage. 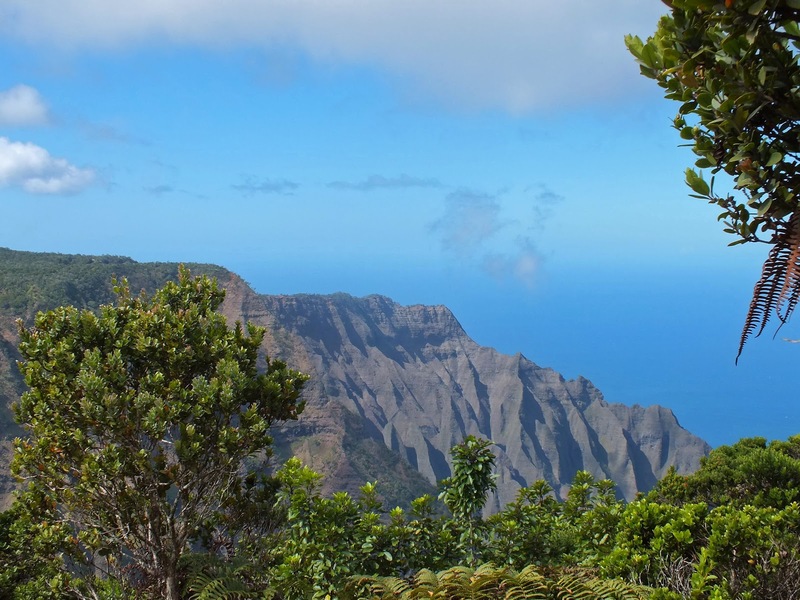 This hike is billed as one of the most impressive hikes on the island. 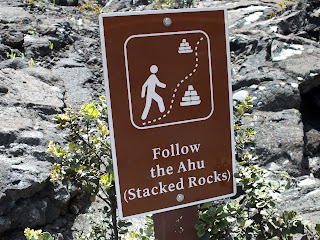 So, in Hawaii, a cairn is called an ahu. Got it! 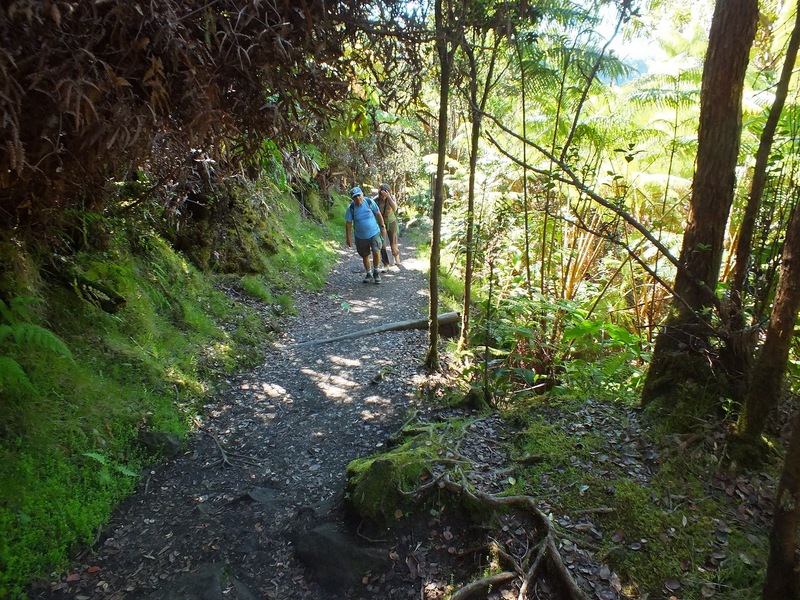 After their return from the hike, they continued around to the Thurston Lava Tube. One of their impressive photos of the tube is seen below. This particular lava tube has been cleaned up and lighted for regular visitation by hordes of tourists. 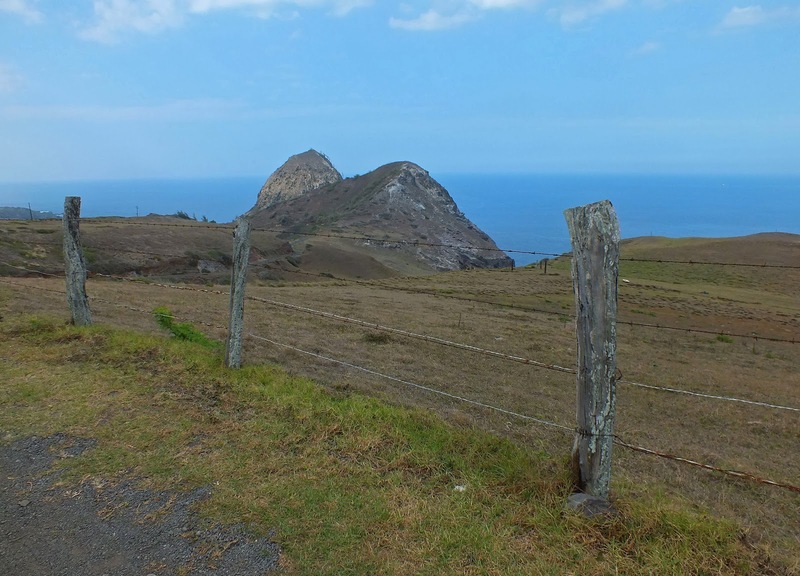 Apparently, Chris and gang got there at an opportunistic time when bus loads of tourists were not around. Forgive me, Chris! The writer isn't sure where yesterday ended and today started because the four tourists were in the same area both days. 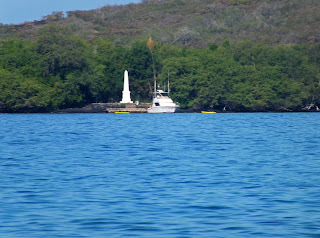 To the right, is a photo of a Captain Cook Monument. 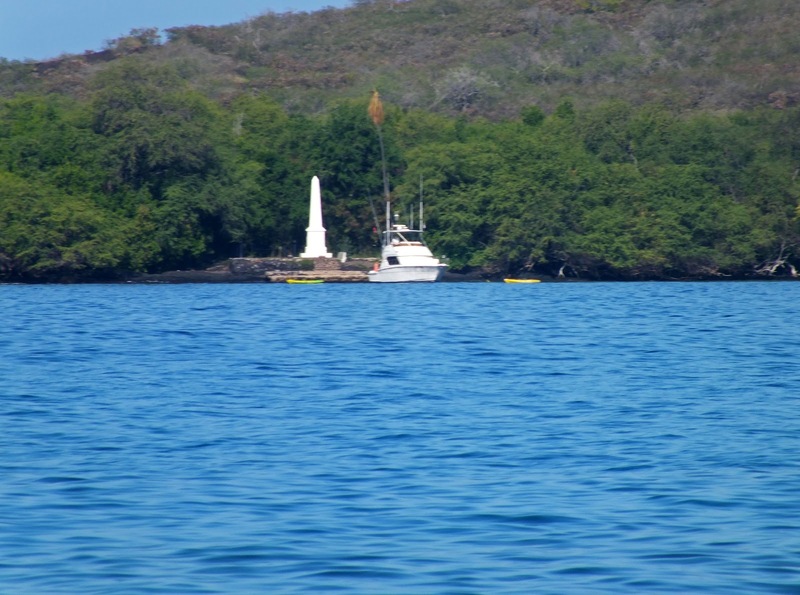 The great story here is that Captain Cook (yes, THE Captain Cook) arrived in Hawaii on one of his explorations and due to a prediction made by the natives, they thought he was a god. He was treated very well and eventually, he left. BUT, his ship ran into trouble soon after and he had to return. At this point, the Hawaiians knew he wasn't the god they thought he was because he wasn't supposed to come back. ... So they killed him. 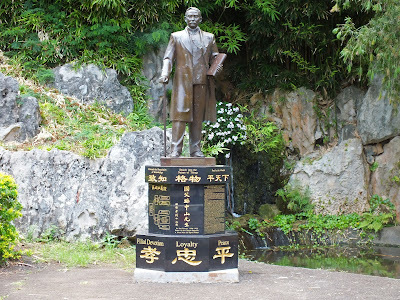 This is his monument. 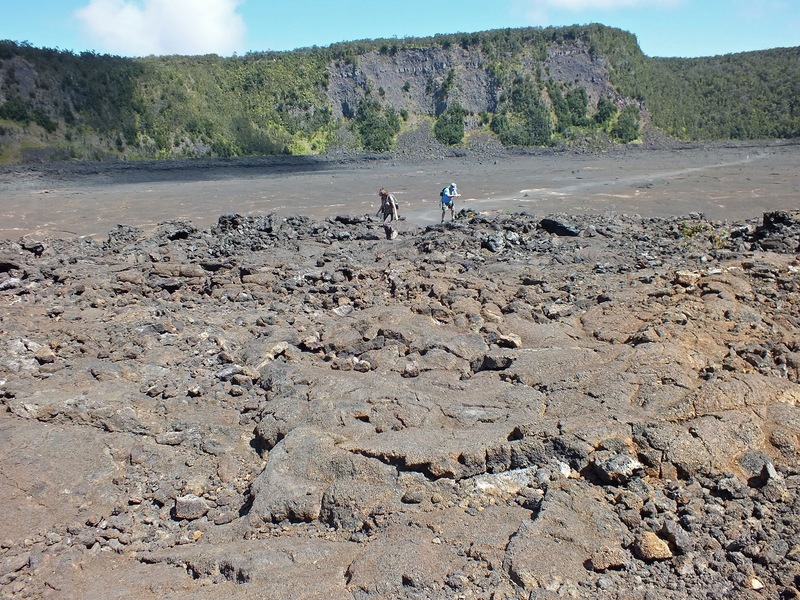 Starting back at the Kilauea Caldera, Chris and the gang started down the Chain of Craters Road which used to be a twenty mile road to the sea before the most recent lava flows beginning in 1983 forced a re-route. 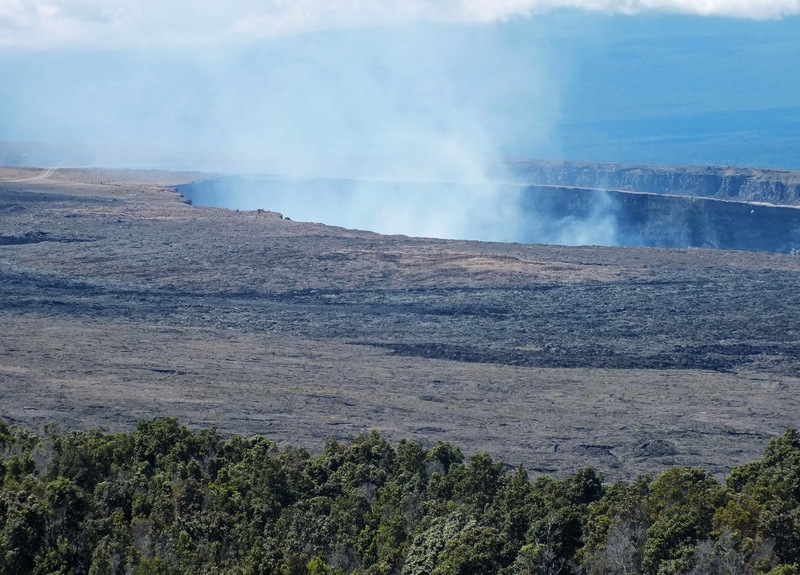 Visitors can no longer see the lava flow from the road but 575 acres of new Hawaiian land has been created. In the photo to the right, Chris is doing what he does best ... directing the masses! 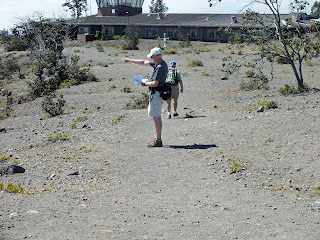 The building in the background is assumably a Visitor's Center at the Hawaii Volcanoes National Park which contains the Kilauea Caldera and the Chain of Craters Road. 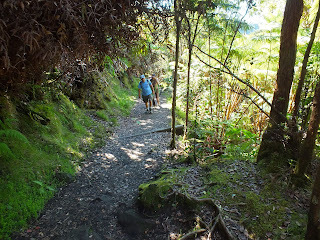 There is an eighteen mile trail in this area that Chris would like to do someday. Anyone interested? The writer is. 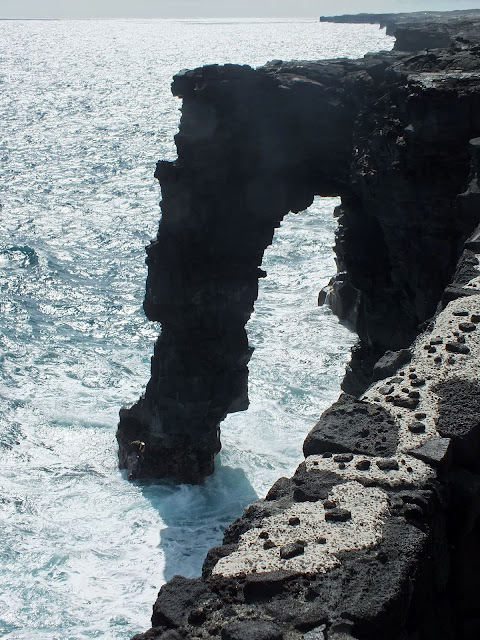 This is the Holei Sea Arch where the ocean has undercut the rock. It is found near the 19 mile marker on the Chain of Craters Road. They stopped in for a look at the flowers in the Akatsuka Orchid Gardens. Guy and Rosie had left to go back home from the Big Island. Chris and Diane continued their tour of Hawaii in Maui where they first hiked at Haleakala National Park. 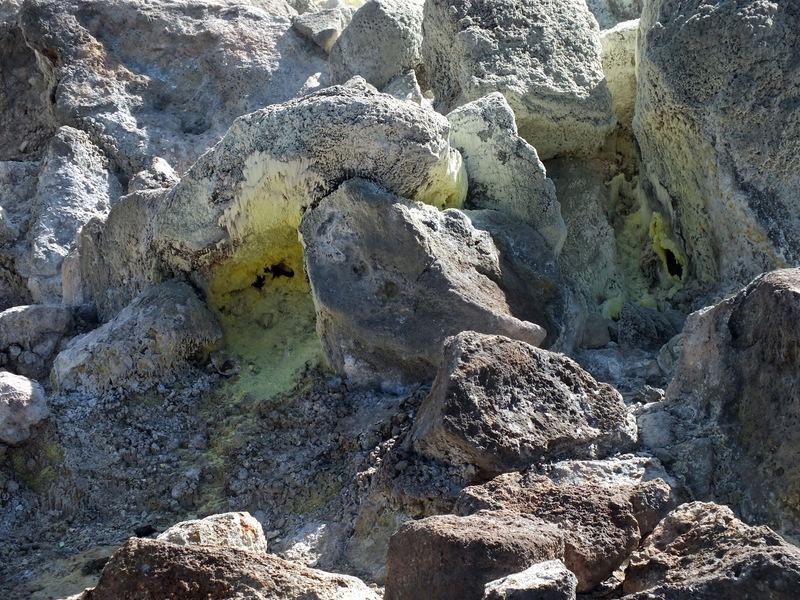 These three photos show a beautiful setting of colorful volcanic terrain as fog rolled in from the sea. 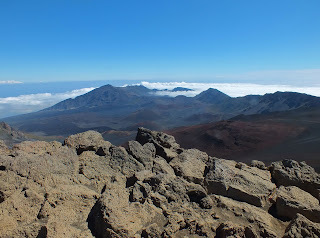 This view is from the summit of Pu'u'ula'ula. 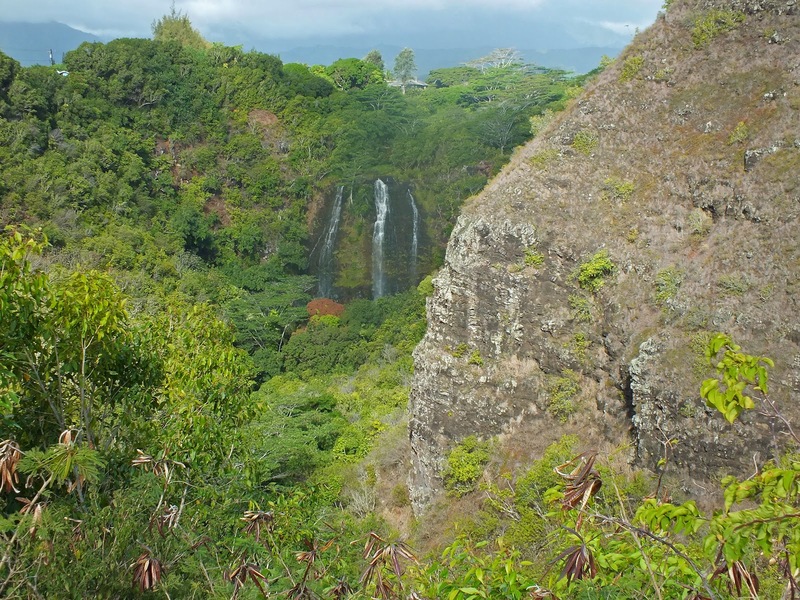 Maui is described as being summer every day and winter every night. 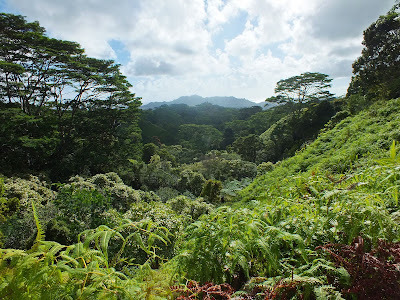 Again, the weather changes from rainforest conditions to dry desert terrain as you travel from the eastward side of the island to the west. 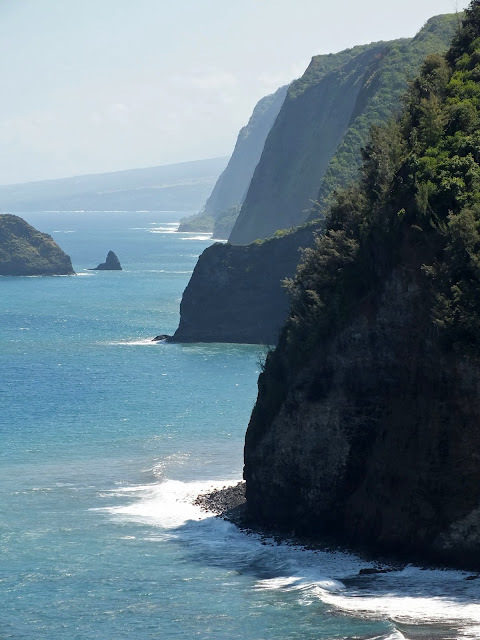 An interesting fact about the Hawaiian language is that besides the regular vowels A, E, I, O, U there are only seven consonants H, K, L, M, N, P, and W. When reading a word in the language, a ( ' ) means that you must pronounce both vowels on either side of the punctuation. When visiting Hawaii, Chris learned how to say many of the place names by hearing them over and over. 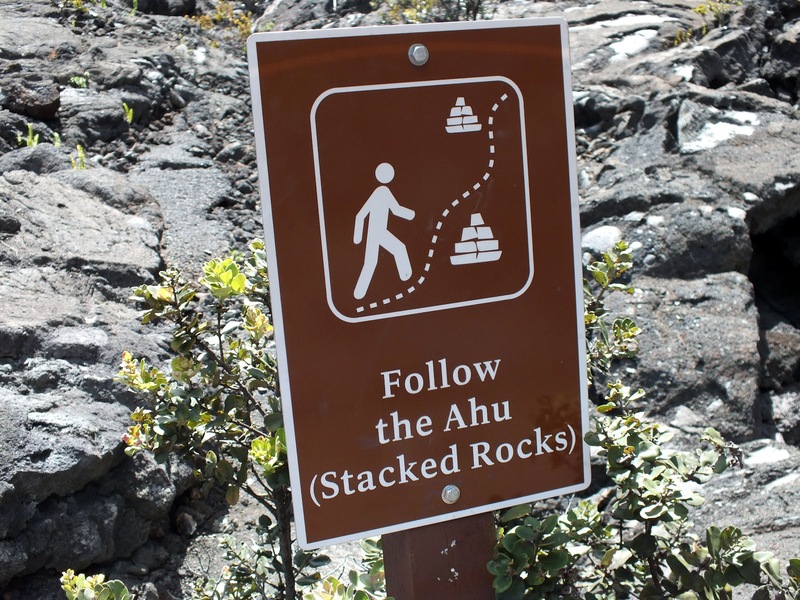 Although we drop the punctuation normally, the native language spells the state as Hawai'i. As Chris and Diane drove from Haleakala to Kapalua they came across sections of the road that were only one lane for both directions of driving. (Be vewy vewy careful!) The statue above was inside a park honoring the Asian immigrants who settled in Hawaii. 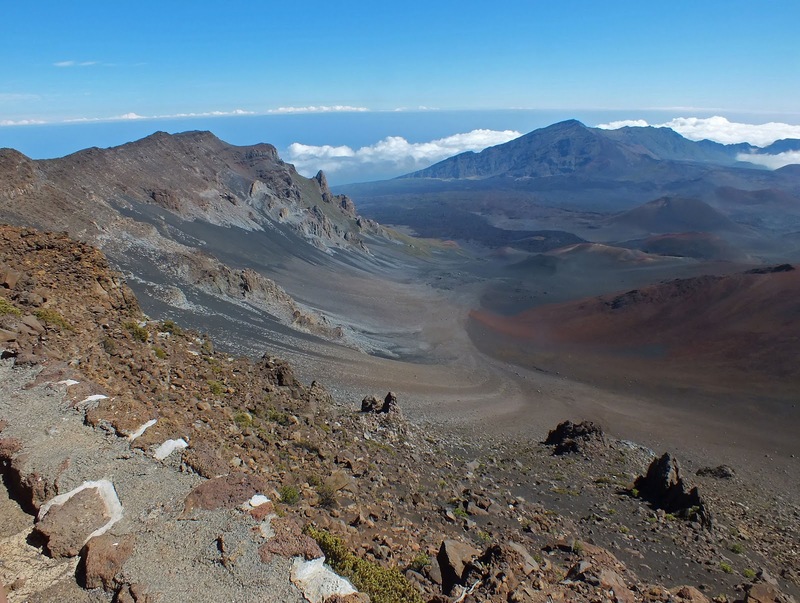 The scene to the left is found on that rugged road that travels around Maui. 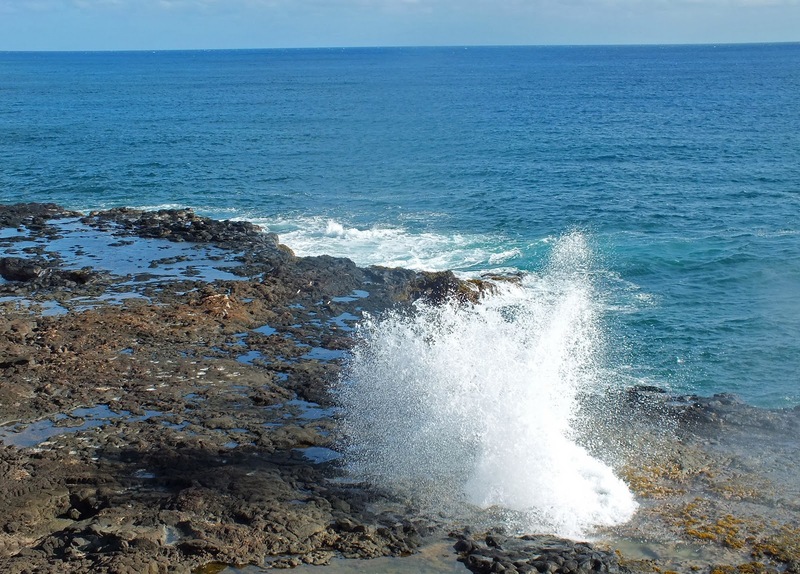 Also on the shoreline road, the pair came upon a blowhole. 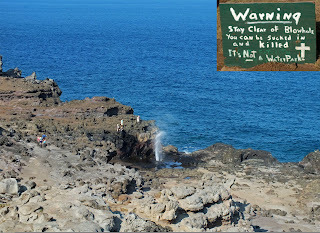 Apparently, there are several blowholes of this type that were made by the old lava flows. The sea comes in from below and shoots a geyser through the rock. 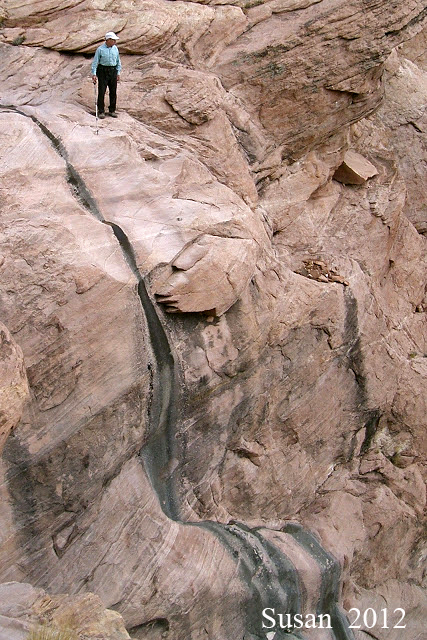 Then, just as quickly, the water returns through the hole below. 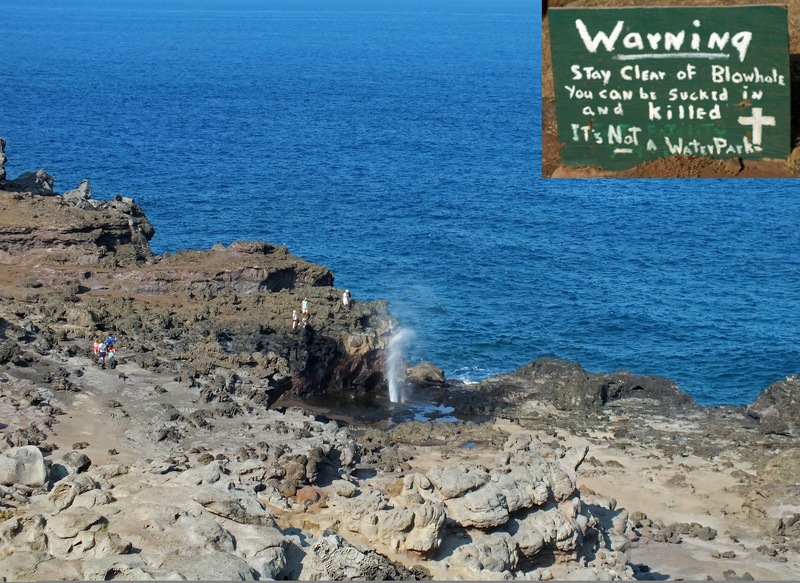 People are warned not to go swimming near the blowholes. 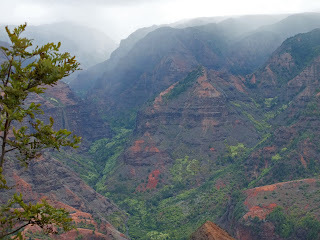 Chris and Diane moved to Kauai for the next weekend's excursions. 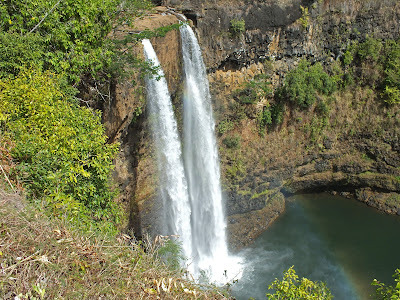 Travelling to the Wailua section of the island first, they found the 'Opaeka'a Falls, seen above, and took a short hike to them. Later, the highway took them through the beautiful countryside where many crops are grown and the scenery never stops. 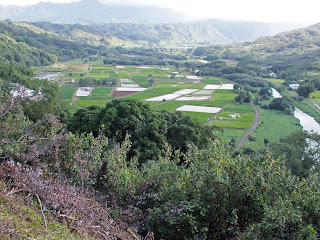 To the left is a photo from the Hanalei Lookout. 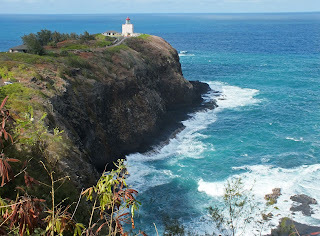 In the former plantation town of Kilauea is the Kilauea Lighthouse. Sitting on a bluff, it represents the northernmost point of the main Hawaiian Islands. 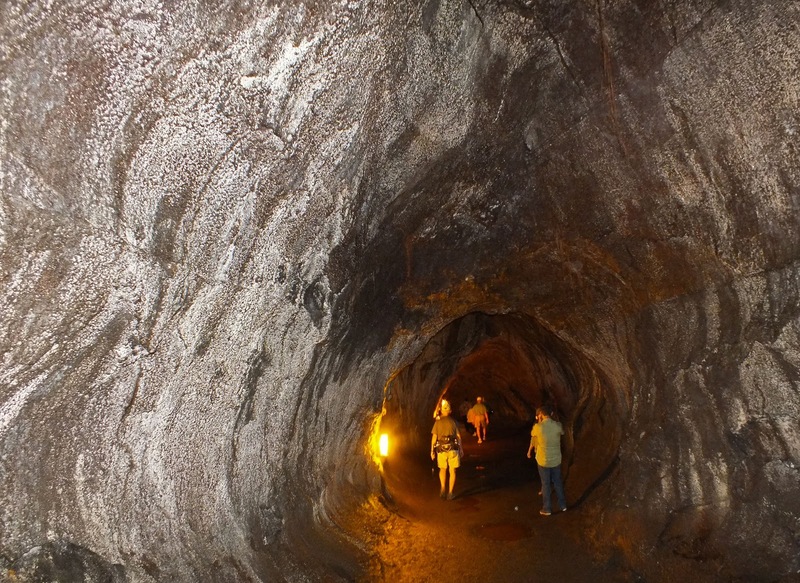 It was built in 1913 with the largest clamshell lens of the time. In the 70's, the lens was replaced by a beacon. 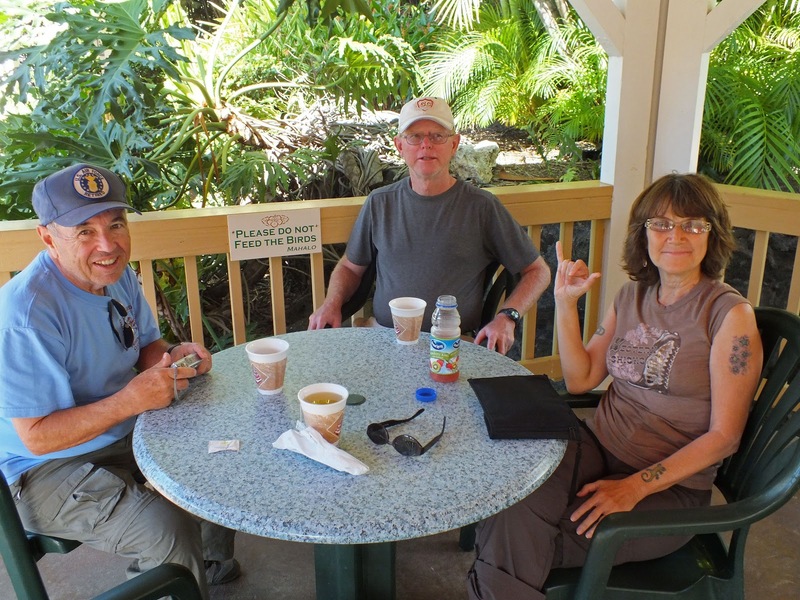 The photo below was taken on their return to their accommodations, The Point Po'ipu Resort. 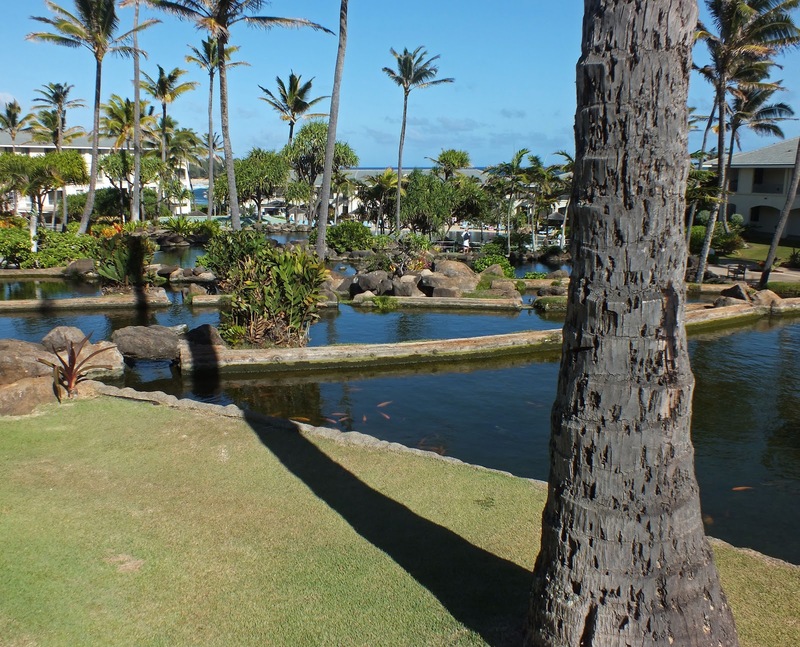 The pools had goldfish in them and the nearby beach had sea lions. The next day, Chris and Diane visited Waimea Canyon or, as Mark Twain described it, "The Grand Canyon of the Pacific." The canyon is ten miles long, one mile wide and more than 3600 feet deep. 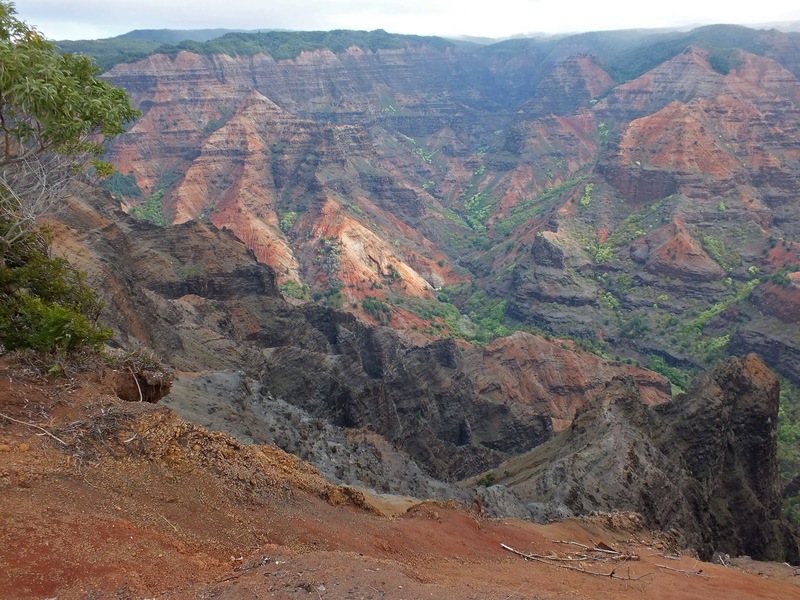 Layers of different lava flows can be seen on the walls of the canyon. 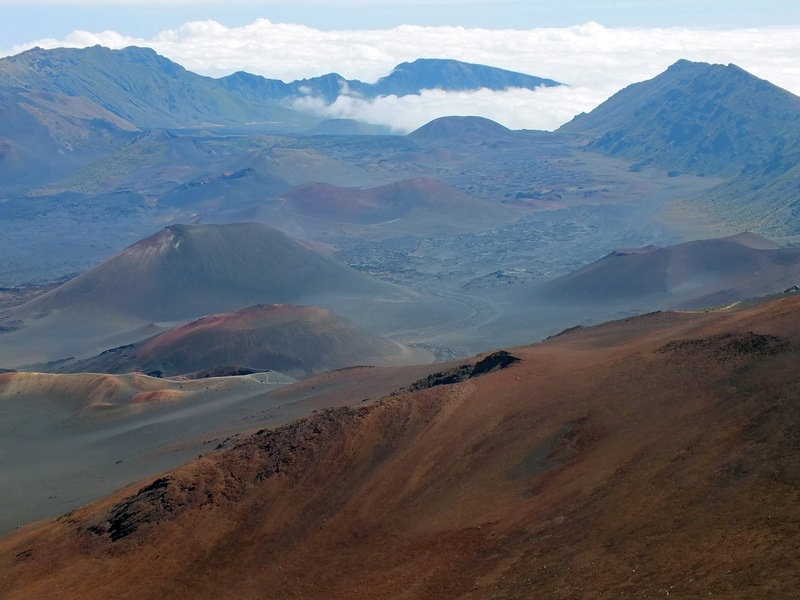 At one time, three rivers ran down the side of a volcano. 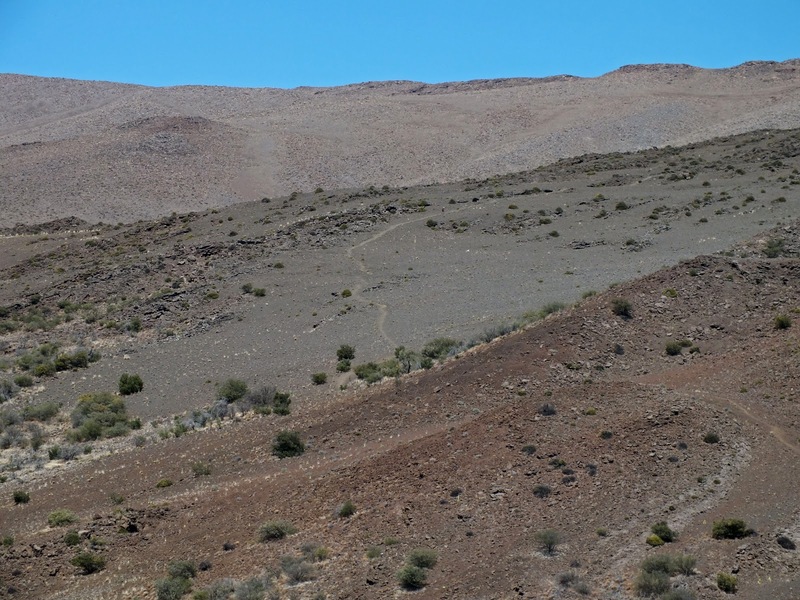 A fault collapsed one side of the mountain and the three rivers ran into one. 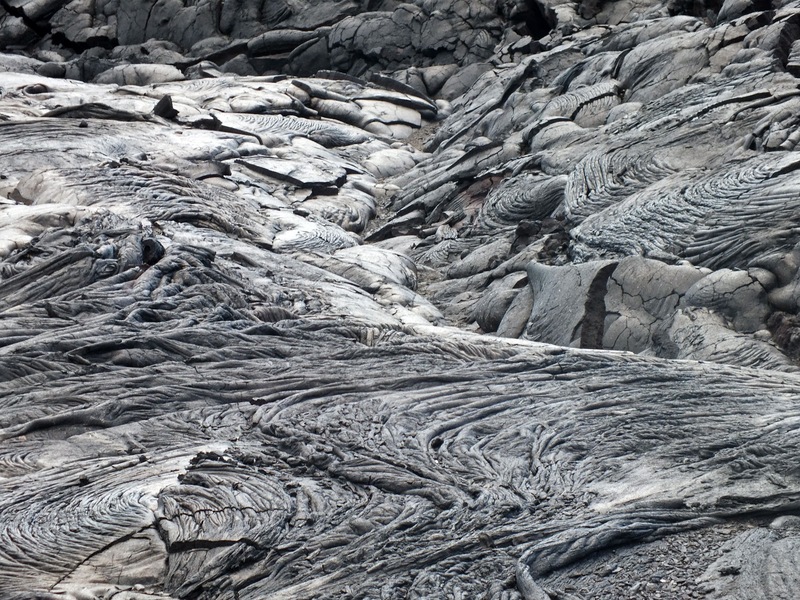 The canyon was the result of the huge river flow through the uneven and fractured lava flows. In the photo to the right, we see Chris venturing out to the edge of the canyon. If you look in the top right of the photo, there are several windows and arches which were made by that uneven and unpredictable lava rock. 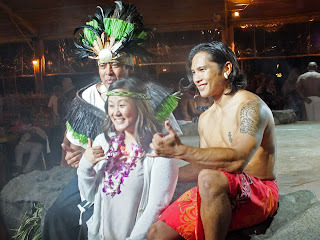 And, what would an Hawaiian vacation be without the required cultural entertainment? Chris and Diane saw two shows. The first was better than the second, however, it seems they made some native friends anyway. Thumbs up! Following the mid-day entertainment, Chris and Diane continued to the Kuilau Ridge where they hiked out into the rainiest spot on earth. It rains on the peak in the photo below 450 inches every year. This peak is called Wai'ale'ale and is 5148 feet above sea level. The day they were there, no rain! Even the peak came out a few seconds for the photo. 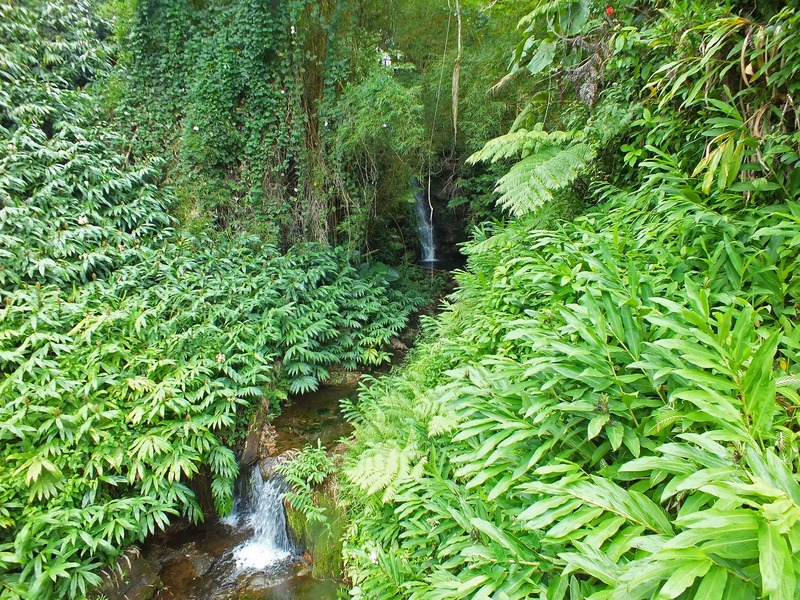 Melaleuca oil (Cajuput oil) is distilled from the fresh leaves and twigs. 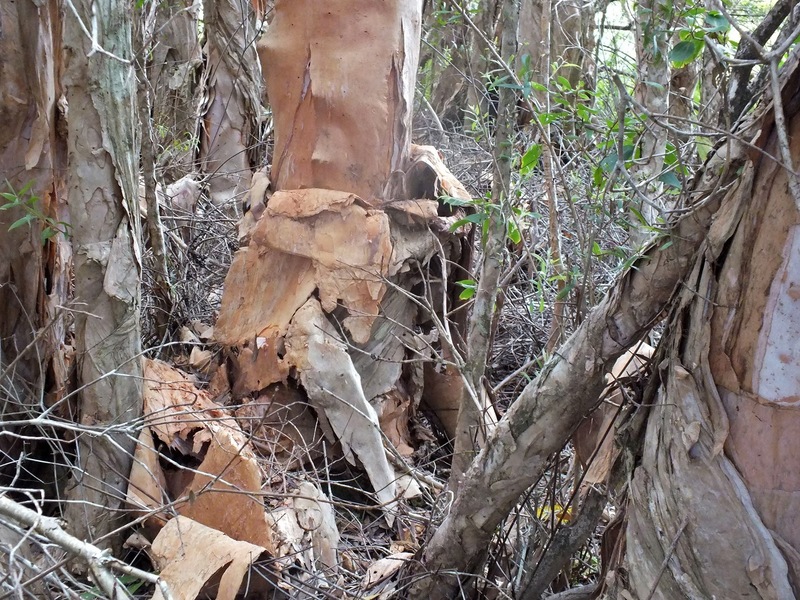 The oil is obtained from several species besides Melaleuca leucadendron. 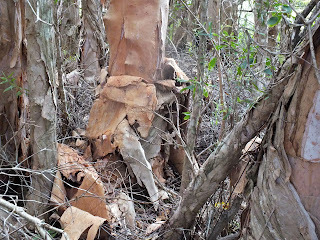 Similar oil, Tea tree oil, is usually extracted from a family member, Melaleuca alternifolia. Melaleuca oil is used in medicine and for a variety of other purposes. The principal constituent of the oil is cineol. Solid terpineol is also present, and several aldehydes such as valeric, butyric and benzoic. 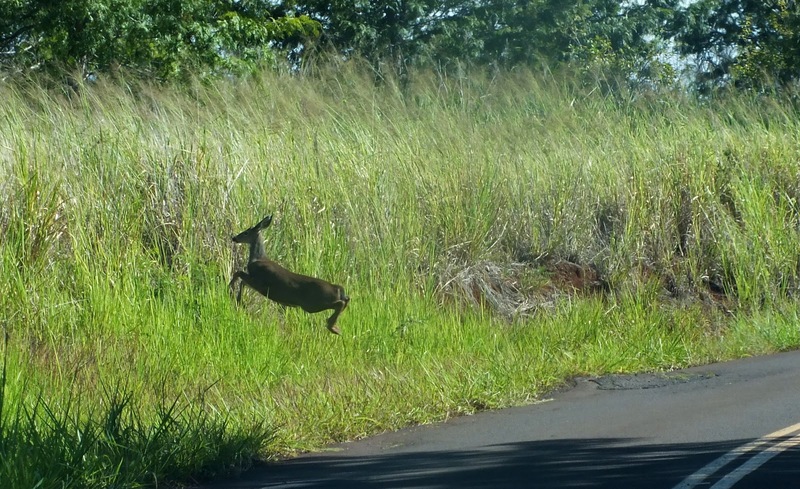 Black-tailed deer were introduced to Kauai in 1961 from Oregon. 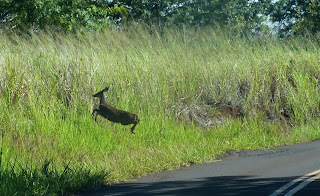 Now, the deer have multiplied and are spreading invasive species of plants on the island. The one in the photo to the right was scared away by a car coming from the other direction. The last day of explorations was spent hiking the Pihea Trail. 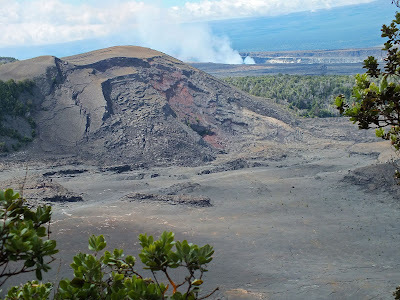 The photo above was taken from the Pu'u o Kila Lookout. It is here where Hawaiian geese, called nenes, hang out to beg for food. 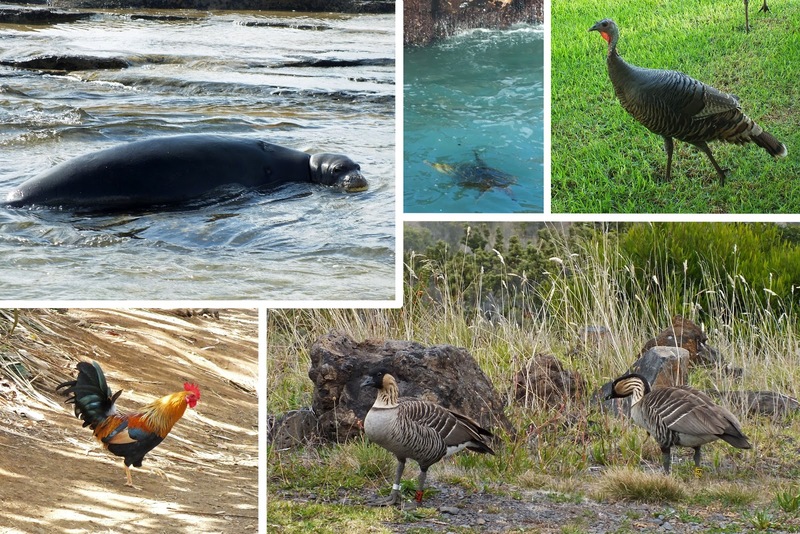 They are descendents of the widely known Canadian geese. 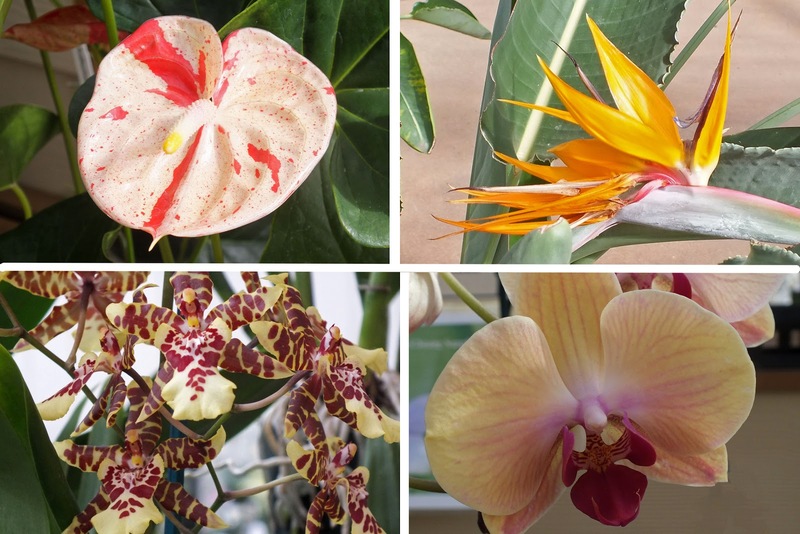 A photo of two of these are in the collage below. Nearby the blowhole to the right, Chris and Diane watched large sea turtles swimming in the surf. Wild turkeys and chickens roamed the islands as well. This Hawaiian vacation came to a close, however, Chris and Diane vow to return. 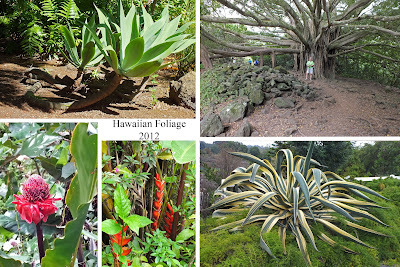 Hawaii may be a state that can please just about anyone for vacation fun!